Yogurt is a beneficial alternative for our daughter who dislikes drinking milk. We always have a stock in the refrigerator or freezer for the kids to snack on. However not all yogurt is nutritious. While a high quality plain is the most wholesome choice it is not always a kid favorite. Look for yogurt brands without added artificial flavors and dyes or high fructose corn syrup. I love Chobani honey flavored Greek yogurt because it is made with only three ingredients: milk, honey and 6 strains of bacteria. Mountain High yogurt is my top choice because they use real hormone free milk and fresh fruit without the extra additives. Mountain High can be found in most Costcos and supermarkets. Use yogurt in the place of sour cream, cream cheese, cream, butter, mayonnaise, milk, and whipped cream in most recipes for smoothies, dips, soups, toppings, and baked goods. 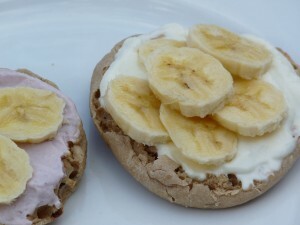 English muffins with fruit and yogurt is perfect for breakfast or as a hearty nutritious snack. Include this recipe as part of a buffet style brunch. Set out bowls with different flavors of yogurt, honey, nut butter and fruit. Add a sprinkle of wheat germ for extra goodness. Toast english muffins. Spread with choice of yogurt. Top with favorite fruit. Forego the bread swapping it with pieces of fruit. Place sliced or chopped fruit in a small bowl or cup. Add yogurt and more fruit. Top with a dollop of yogurt or whipped cream for a parfait.